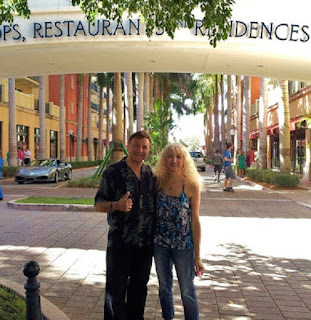 The photo above is my brother John Colenzo and I at the Village Of Merrick Park in Coconut Grove, Florida. John suggested this would be a treat to see all the fine cars and retailers here. 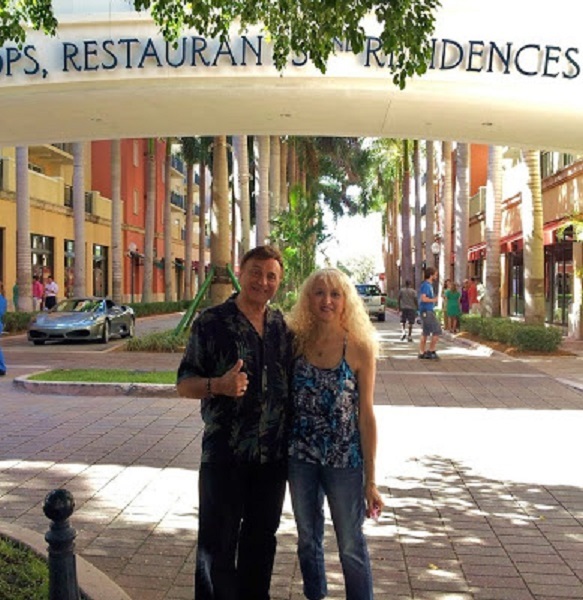 John, besides being my brother, is a music entertainer in Fisher Island (not too far from here) and has some great friends in the area who you'll meet further down the article posted below. Merrick Park has several Retailers here to see, to include and name a few are anchors Neiman Marcus and Nordstrom's. Quite some interesting finds here. If you are lucky enough to own a Lexus (my favorite car) it's free valet parking. The rest of the vehicles would have a fee. Some very impressive vehicles we saw were the Bentley, Ferrari and the least expensive, a Corvette (still very respectable)! A car buff and lovers dream place to visit here! There's always something at Tiffany's. This a beautiful jewelry store and showcased perfectly! Nordstrom's by far had the best customer service as we walked through. The staff was greeting everyone, asking how we were doing, throughout the entire store! Affordable and some great buys! Everyone was so engaged and cheerful throughout the store! A great experience! Here was the biggest disappointment and let down. Neiman Marcus. This upscale classy store who sells Prada, Gucci and many other big designer names, was by far the worse customer service experience, I guess we just didn't look the part, rich enough. Not one associate made eye contact, greeted us or offered any help, of course that may be just the way they are trained of course and we shouldn't take any offense. We visited the ladies, men's, shoes, cosmetics and jewelry departments, no greeting or associate interactions. No one once asked if we needed any assistance, then to make matters worse, see the clearance section below and how much it looked like a rummage sale! Here is their clearance area!!!! Not acceptable, clothes on the floor? Off the hangers? Nothing was sized or shopable. The shirt on the front hanging went for $780.00 with 25% off? This looked like a basement no bargain rummage sale! Absolutely shocking! This was my first time there. Prada snake skin purse $4000.00, Shoes $1100.00, wallets at $850.00. All presented very nicely in small stand alone shops inside the store but their clearance section was a customers nightmare. Customer service throughout the store was non existent! Amazed, just amazed. Here was the highlight of my stay here in Coconut Grove. A great Portuguese Restaurant suggested by my brother, see the menu above. The owner is a very good friend of his, actually one who also worked with him on the Island some time ago. What an amazing gourmet dining experience this was , you don't want to miss this one if your ever down this way. 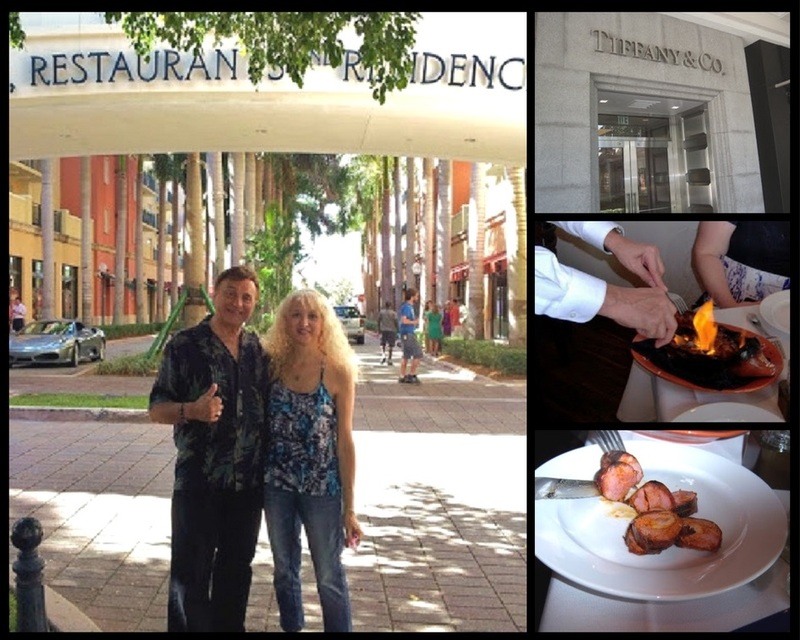 Coconut Grove's finest in Portuguese Food and Gourmet Experience. Old Lisbon Restaurant 1628 S.W 22nd Street Coral Way, (Sunset) Miami Florida 33145. Owner Rui Martin and good friend of John Colenzo. Rui is 100% about customer service, he greets and treats everyone like his own family. The staff was so accommodating. The food superb. You will not find a better dining experience with this kind of hospitality, thank you Rui! This came in a ceramic pig to the table lit up in flames! Awesome presentation! Preheat the oven to 375 degree hot oven. Place rack to the middle position. Paper line a 12-cup cupcake tin. Whisk the cornstarch in 1/4 cup of the milk. Set aside. In a food processor, pulse the coconut flakes for till fine shreds. In a large mixing bowl, stir the eggs and sugar beating together with a wooden spoon. Add in the cornstarch mixture, rest of the milk, coconut, melted butter and vanilla extract, stirring well after each addition.Put the custard into the paper cups, filling to 1/4 inch from the top. Bake for 25 to 30 minutes or until the coconut is nicely toasted. Cool completely. Serve with ice cream, whipped cream or fresh fruits. Hi Pegasuslegend, thank you for visiting my blog and leave your lovely comment. I'm following you too. Thanks for sharing all the beautiful photos. The ice cream with coconut custard sure very tempting. I love your recipe, it definitely taste like a piece of heaven if serve with ice cream and top with some fresh cut fruit. Or maybe canned cocktails, it'll very refreshing. I want some black eyed peas salad! Coconut tartlets look lovely. Nice the photo of you and your brother. Glad the meal made up for the less than stellar shopping experience. Sounds like a wonderful time you had with your brother, though. Ugh, I can't tell you how much I hate snotty salespeople--they totally ruin the experience. It looks like you had such a great time! Too funny that you only get to park for free if you have a Lexus. Neiman Marcus snobs! Heehee. All the food looks delicious! You hit a note with me about customer service. The shops here aren't too bad but most of the restaurants are shocking. Maybe someone will greet you at the door, maybe you'll be shown to a table and maybe after about 25 minute someone might take your drink order. There are exceptions and it's shockingly obvious - like our night out this week at Cala Luna. The difference, of course, is that Australian servers are paid a decent wage and there is no tipping so no matter how much good service they give, there's no incentive to pick up their game. I love shopping in Florida! What a fun time you had in Coral Gables; I haven't been down there in at least 3yrs...I love the area! So you were 'whining'...and wininig and dining! I agree about the prices and the way that bargain section looks like. Unreal prices, and a big mess. Who would want to look through those racks. Such a shame! On the other hand, I love Portuguese cuisine, everything looks amazing. Love the sausage, and that yummy custard! Dear Claudia, I cannot believe the prices!! Who would pay that for a wallet, skirt or any other item on those racks!! Now, food is another story...I bet you had a delicious and great dining experience. I love trying new food. I am so happy for you. Spending good times with family has no price.